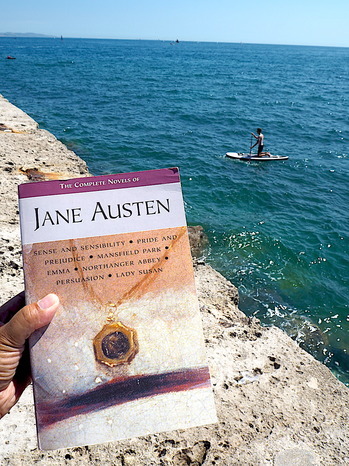 In Search of the Stairs in Jane Austen's \"Persuasion\"
A walk along the famous Cobb, the wall that protects the harbor, must be high on the list of anyone visiting Lyme Regis. 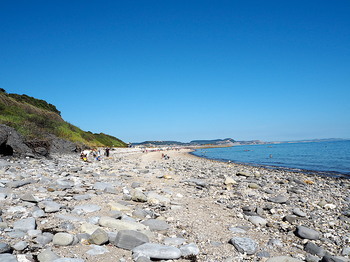 The town is known for the fossils found in the cliffs and beaches, which are part of the Jurassic Coast, a World Heritage Site. I was one of the many whose main purpose of visiting was not to search for fossils, but to see the stairs from where Louisa Musgrove fell in Jane Austen's novel, Persuasion. But there were others before me, most notably, Lord Tennyson, who walked nine miles from Bridport to Lyme in 1867, and when he called upon his friend, fellow poet Francis Palgrave, he refused all refreshment, demanded to be taken to the Cobb, and commanded, "show me the steps from which Louisa Musgrove fell." 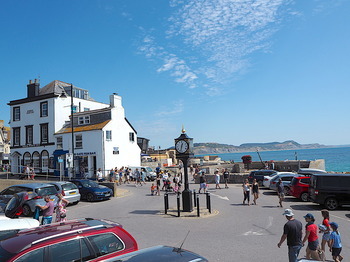 Up until that time, the historic seaside town of Lyme Regis, cited by Austen as "Lyme" in the book, was mostly only known as the landing site of the Duke of Monmouth's failed rebellion of 1685. How generations of readers can turn a minor character and a dramatic scene into a literary destination is always fascinating. We spent only a day in Lyme and unbeknownst to us, we visited during the annual Regatta and Carnival Week (August 3-12), so there were no parking spaces, and the sandy parts of the beach were absolutely packed. The crowd thinned out as we got to the Cobb, still I thought I should be very careful--the goal was to find the stairs, and as much as I marveled at every chance of a Jane Austen connection, I didn't want the stairs to be known to family and friends as "the stairs where Catherine fell, as well." The text from Persuasion is the most important clue as to the location, but I also used the films as a point of reference. I watched the 1995 film version, and I learned that there were two other films made, in 1971 and 2007, and all three films used three different stairs! 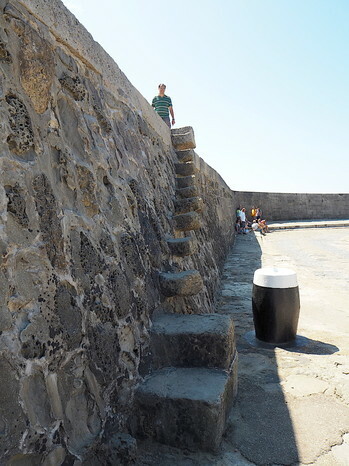 But as soon as we got to the Cobb, it was easy to find the stairs, all three were a short distance from one another. The first we saw was the double staircase used in the 1971 film. I didn't think they were the ones Austen thought of, they were solid and even the way the fall had been depicted in the film was too contrived. Furthermore, the plaque underneath this double staircase suggested that it had been repaired and completed in 1826, and I presumed that these stairs had only been added that time. Austen died in 1817, and she visited Lyme in 1803 and 1804, so she wouldn't have referred to these stairs. Walking farther, we encountered the second and most popular choice of stairs, locally known as Granny's Teeth, which were featured in the 1995 film. Before this trip, I searched the internet and read many sites, many of them quite reputable, that believe Granny's Teeth to be the steps mentioned in Persuasion; not surprisingly, as even the Jane Austen Centre said this set was "the most plausible spot for Louisa's fall." They, too, are my favorite stairs, there is just something believable and romantic about them that is easily identifiable with an Austen novel. When you see Granny's Teeth, you might think the name impolite to grandmothers but it is also the kind of name that Austen would come up with, as honest as she was, I thought. Also, they are so steep that a woman clad in a Regency dress is likely to fall, even if one is very careful. The last stairs we encountered (seen in the 2007 film) are the most likely candidate according to locals doing tours in the area, and indeed this is true, if chapter 12 of Persuasion is to be the source. "There was too much wind to make the high part of the new Cobb pleasant for the ladies, and they agreed to get down the steps to the lower, and all were contented to pass quietly and carefully down the steep flight, excepting Louisa; she must be jumped down them by Captain Wentworth." 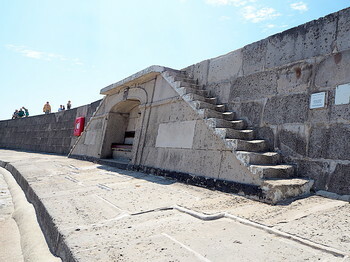 Here, Austen referred to the "new Cobb," the part that was destroyed towards the end of the eighteenth century, and rebuilt just before her first visit, where these newer, more modern steps than Granny's Teeth are located. I'm not sure which stairs Tennyson's friend had shown him, but I bet he would not have been as annoyed as I was seeing how crowded the bottom of Stairs No. 3 was that day. No time to sit on the step and close my eyes in reverie, with people going up and down every few seconds. Well, they were the stairs closest to the end of the Cobb, the swimmers and spectators needed to get to the events of the day. Had the weather been windy and wet, no one among us would have been allowed there, let alone walk to the end of the wall (no channeling of Meryl Streep dressed in her cloak in bad weather then, from that scene in The French Lieutenant's Woman, also filmed on the end of the Cobb). 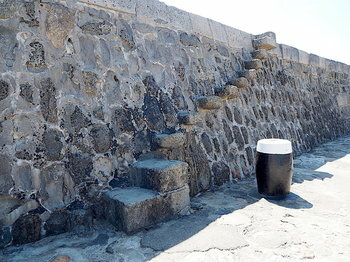 At the end of my visit to the Cobb, I'd forgotten all fear of falling down stairs. 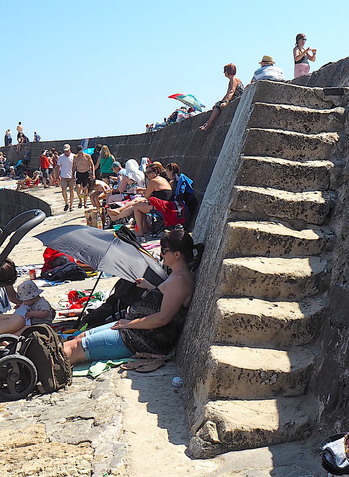 It was the Cobb itself - it was stepping on that sloping man-made wall and being pulled in all directions by a curious three-year-old that was more than scary for me, even if it was a bright sunny day. Someday I'd like to return, during a quiet and dry spring or winter maybe. How exciting it must be for authors to write about something as trivial as a set of stairs and for it to become a fuss later. If Austen were still alive, I think she'd laugh at this confusion and probably say that her stairs were imagined, in the same manner that most of the locations of her stories are fictitious. Images (top to bottom): A walk away from the town, seen in the distance; A view of town, as Austen aptly described it, "the remarkable situation of the town, the principal street almost hurrying into the water;" The double staircase; Granny's Teeth; Close-up of Granny's Teeth; Possibly the stairs from Persuasion; Author's copy of Austen's novels, near the end of the Cobb. Credit: Catherine Batac Walder.